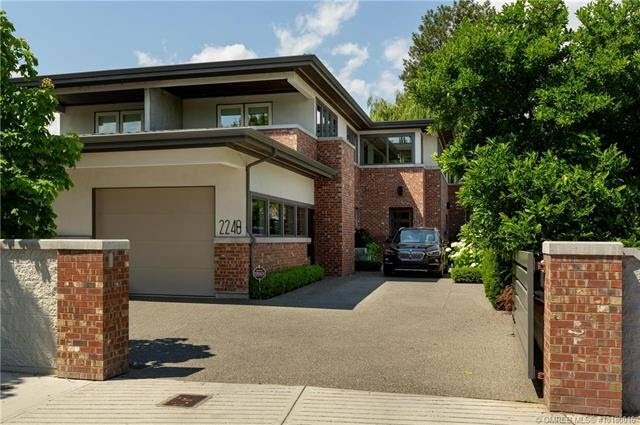 2248 Abbott Street, Kelowna - 4 beds, 4 baths - For Sale | Promerita Realty Corp. Stunning lakeshore Frank Lloyd Wright-inspired modern home that is perfect for entertaining. Composed of red brick and exposed concrete, this privately gated 4- bedroom, 3.5 bathroom home has all of modern amenities you would expect on the beachfront. Open concept kitchen and living room has over 800 sq ft of indoor entertainment space that opens to a covered outdoor patio with BBQ, sunken concrete hot tub, and grassy yard giving direct access to Lake Okanagan. Top of the line AGA stainless appliances in addition to wine and dual mini fridges. There are 2 master bedroom suites - each with ensuites including dual sink vanities, soaker tubs and spacious showers. Two dual facing outdoor decks give sweeping and expansive views in all directions. Secure parking garage and 2 additional uncovered spaces. This home is less than 4 yrs old, in immaculate condition, and not to be missed! First public open house to be held Saturday April 13th from 1-4pm. Please contact Rajeev Opal at 604.653.6725 for more information.